My dad, Jim, was born in Nebraska. He was a simple man. A farmer. A hard worker. Before leaving this life, my father taught me one of the main lessons I teach people now: The 3 D’s. These 3 D’s were never more important to me than when he was on his death bed. It was New Year’s Eve 2006 and I got a phone call that my father was going to die. I was in Tahoe and needed to fly to Nebraska ASAP to see him. My father had never met my daughter (who was 3 months old at the time) and I wasn’t going to let him go without seeing her. Here’s where the challenge presented itself: There were absolutely NO outgoing flights from Tahoe on New Year’s Eve. None. I literally called everywhere and just kept getting no’s. But I was going home. No doubt about it. Luckily, I had a friend in aviation. I dialed him up immediately and asked him to get my family and I to Nebraska. “Loral…it would be $29,000 to fly out,” he said. “I don’t care. How quickly can we leave?” I responded. Before I could blink, my family and I packed up a few essentials, drove to a private airport and were in the air for Nebraska to see my father. So we flew out and got to spend my dad’s last days together. He got to meet his granddaughter and we all spent the waning moments of his life as a family. This whole story was one of my “Say ‘yes’ and figure out how” moments. I was told ‘no, there is no way we can get you to your dad,’ but I said ‘YES, I am flying home’ and figured out how. Deciding: When faced with obstacles, many of you have decided you can’t do it. The decision is already made up in your mind. But when it’s really, really, really something that you need to do, I think it’s fascinating to see how creative you can become to get that thing done. Putting it into action: When the world had told me “no” 100 times, I had already decided to say “yes.” Do the same in your own life and see it transform. Determination: A lot of you have a lack of determination. You have to be determined enough to say yes. It can’t be feigned. Your “yes” must be genuine and driven. Almost a gut YES! Putting it into action: There was no way in hell I was not going to see my father during his last days. Disqualification: A lot of you disqualify yourself based on the fact that you don’t know how to overcome whatever challenged you’re faced with and don’t know anyone to help you do it. Putting it into action: Yes, I was fortunate enough to have a friend in aviation to fly me out, but even if I didn’t, I would’ve made a friend that day. Never disqualify yourself for anything. It’s the most disempowering thing you could do. Always clarify your 3 D’s in life and keep them in mind daily. Consider saying “yes” every day and match it against the 3 D’s. Loral teaches how to develop A TEAM to support your cash machines. She explains the importance of spending your time on what you do best and hire others to support your business. Adam Ward describes what he has taken away from Loral. He shares her fundamental keys to finding success both in business and in personal life. Entrepreneur Success Stories is a book that Katrina is in with Loral Langemeier. 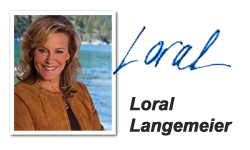 There are dozens of authors and students of Loral’s in this book that share their stories of how they became successful entrepreneurs. There is plenty of valuable advice and even strategies on how YOU can become more successful too. Tracy Loubser: She And Her Husband Are Successfully Taking Charge Of Their Careers. Thanks to working with Loral at the Big Table Tracy and her husband are able to work independently. Now their careers are taking off and they have more time for their family.